Sony showed off an impressive line-up of PlayStation 3 games this week at their E3 press conference, setting the tone for another year of exciting new experiences found exclusively on their flagship console. Kicking off their show was Naughty Dog to present a stage demo of Uncharted 3: Drake's Deception. Even at this unfinished stage the game is looking impressive with explosive set pieces and edge of your seat gameplay moments. Seen in a trailer were returning leading ladies Chloe and Elena﻿, who join Drake and Sully in the Arabian Desert as the two fortune hunters search for the fabled "Atlantis of the Sands. "﻿ Sony promises new environmental effects such as innovative sand, fire, smoke and water dynamics, as well as improved physics and beefed up visuals. An Uncharted 3 multiplayer beta was also said to begin on June 28th and will be open to those who have a voucher from a new copy of inFAMOUS 2 or if you're a PlayStation Plus subscriber. The beta will become open to everyone else starting July 4th, and will conclude on July 13th. Beta participants will have a chance to try out six competitive game modes: Free For All, Team Deathmatch, Team Objective, 3-Team Deathmatch, Plunder, and High Stakes. The beta will also include three co-op modes. Uncharted 3 is expected to be out on November 1. Next up was Resistance 3 from Insomniac Games. 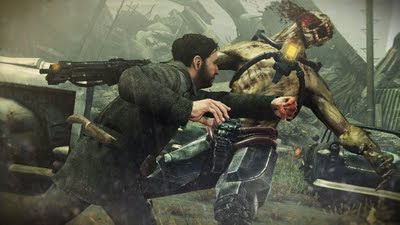 Set four years after the events of Resistance 2, the game follows the dishonorably discharged Sentinel Joseph Capelli as he combats the invading Chimeran menace with a pocket of survivors, including his new wife and young son. In addition to the full single player campaign, Resistance 3 will include two-player online or split-screen co-op through the single-player campaign, and a progression-based multiplayer experience. Key features of the game include smarter and more agile Chimeran enemies, a return of the "weapon wheel" for easier access to your weaponry, new weapons will join fan favourites such as the Bullseye, Auger, Rossmore, and Marksman﻿, and the game will be compatible with PlayStation Move and the Sharp Shooter gun. An all-new Resistance 3 bundle was also revealed and will contain a copy of Resistance 3, a Playstation Move, Navigation controller, the PlayStation Eye, and the Sharpshooter controller frame.﻿ The game will be coming out this September. Sony also showed off a demo of inFAMOUS 2, the electrifying sequel to 2009's hit open world action game. Continuing Sony's trend of remastering hit games from their vast game archive was the announcement of God of War: Origins Collection﻿, which compiles Kratos' two PSP outings, God of War: Chains of Olympus and God of War: Ghost of Sparta, on a single Blu-ray disc. Fully remastered in 1080p and stereoscopic 3D, players can experience the popular PSP games in 5.1 surround sound and with Dualshock rumble and PlayStation trophy support. Much to the delight of fans, Sony finally unveiled a new addition to the Sly Cooper series with Sly Cooper Thieves In Time for the PS3. Not much was shown of the game aside from the game's logo and a short trailer showing a 2012 release window. Sony showed a bit more of their upcoming third-person space combat game Starhawk with a new trailer and an early 2012 release date. A new PlayStation Move game called Medieval Moves: Deadmund's Quest ﻿﻿was also shown during the press conference, and is being developed by the team behind Sports Champions. The fantasy, action adventure game ﻿features non-stop action with hack-and-slash gameplay that replicates real world combat movements. While not much was shown in the way of the new Twisted Metal, the game was playable on the show floor.